Just like their humans, pets can suffer from injury, old age, and other ailments associated with being a living, breathing thing in this world. For these reasons, Dogwood Veterinary Hospital has expert doctors who can administer Companion Laser Therapy to your pet. Companion Laser Therapy is a holistic, non-invasive treatment that can help your tail-wagger feel his best. Laser therapy is used to treat a variety of conditions and can be performed in conjunction with other treatment protocols. But how do you know if laser therapy is right for your pet? First, it’s important to understand what Companion Laser Therapy is. When you think of lasers, the first thing that may come to mind is perhaps an evil villain that shoots laser beams out of his eyes. The word “laser” can sound scary since it’s usually affiliated with irritation or discomfort. However, in cases of companion laser therapy, you need not worry about your furry friend feeling any pain. Companion laser therapy, also referred to as cold therapy, stimulates an animal’s body to heal from within. Non-heated photons of light are administered to your pet’s body and absorbed by injured cells. The cells are then stimulated and as a result, respond with a higher rate of metabolism. This culminates in relief from any pain your pet may be feeling, as well as increased circulation, reduced inflammation, and an acceleration of the healing process. Pets who are experiencing discomfort usually relax and enjoy the treatment, feeling almost an immediate sense of pain relief! Don’t be surprised if your schnauzer snoozes through his visit. What are some signs that my pet could use laser therapy? 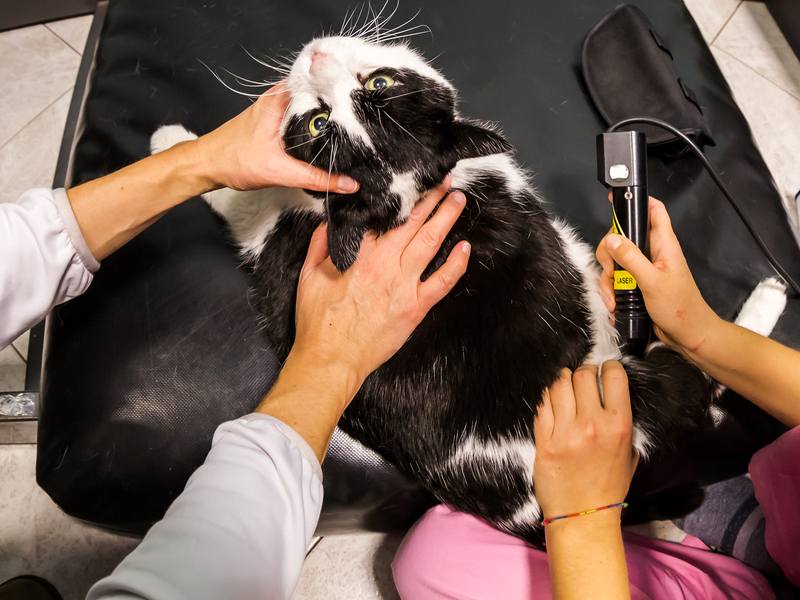 Laser therapy is an innovative veterinarian technique that can treat pain, reduce inflammation, and accelerate the healing process of your fuzzy family members. Whether your pet is recovering from injury or trauma, healing from wounds, or simply aging — your cat or dog can benefit from companion laser therapy at Dogwood Vet. They’ll be back to playing, cuddling, and behaving like their former selves in no time. If you feel like your pet could benefit from laser therapy or you are interested in more information about the treatment, feel free to contact us at Dogwood Vet today!